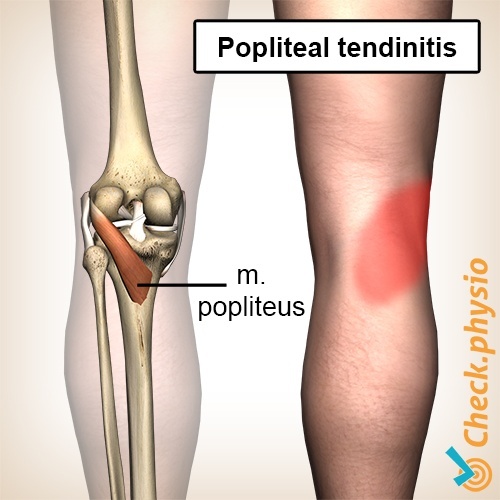 In the case of popliteus tendinitis, the tendon of the popliteal muscle is inflamed. The muscle is located at the back of the knee and can cause symptoms, for example, whilst running. Running downhill can provoke the symptoms. The function of the popliteal muscle is to flex and turn the lower leg inwards. The popliteal tendon is inflamed. This tendon runs from the back of the knee to the outside of the knee. Popliteal tendinitis can have several causes. The symptoms can occur with excessive inward rotation of the feet (pronation), with downhill running or always running on the same side of a sloped road. This causes excessive strain and inflammation of the popliteal tendon. The pain is located at the back of the knee and along the outside of the knee. The symptoms occur mainly during (downhill) running.